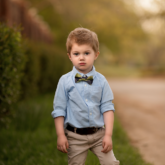 Memphis Child Portrait Session | Oh Boy! I’ve had a lot of positive comments about the little boy in my Black Friday ad. He is not a model. He is an ordinary boy, having fun. Some people thought I had switched to adults/teens only. Actually, I shoot all ages. This little guy was 2, and about as fun as they come. Soo adorable. Such a little charmer. Here he is in a sweet little bow tie I put on him from Littlest Prince Couture. They have the best quality ties, bow ties, & suspenders for boys! I first tried them out this past Spring, and boy, am I glad I did. I always have a stash of accessories for girls, but now I also enjoy having backup accessories for my little guys too.